Have you found an online vendor selling Neisson White 50? Considered as the "king" for the ti-punch in Martinique. Neisson est réputé pour faire le meilleur rhum blanc de Martinique! En ayant déjà goûté pas mal de rhums blancs, je dois dire que ce Neisson blanc 50 est le meilleur que j'ai pu goûter en ti'punch! Jerry is right, people from Martinique considers this rum to be the best for Ti Punchs (Half rum + brown caster cane sugar + a quarter of lime). I'm not that fan of it though. I don't find as sweet as a Clement rum of the same proof for example. I finally got to try a rhum agricole from Neisson. Thanks to reading many of the reviews here, my first try was based upon an informed guess combined with my knowledge that too much aging in wood ruins rhum agricoles. The aroma and taste are just like any premium artisan cachaca except that this 50% ABV can choke you going down neat. I know that is the best recommended rhum for Ti Punch, but I would not waste it on that drink, which is like the Martiniquan version of doing tequila shots. So what lies between neat and Ti Punch? On the rocks and that works best for this drinker. The entire liter of this high proof rhum was only $37 and is readily available in stock not too far away. This also beats the pants off of J M White 80 proof for taste. I doubt that I could find a better white agricole blanc rhum. So why only a 7 rating? I rarely get into my moods for cachacas. And as others have suggested, this rhum does indeed go well with fruit juices. I tried it with guava nectar as well as guanabana nectar, and both paired quite well with it. Visited the Neisson Distillery while vacationing at Martinique. Splendid distillery tour followed by an open tasting bar. Neisson Blanc 50 was priced at EUR 13 at the distillery. Very nice old school bottle and label design. Traditional sweet Rhum Agricole notes followed by grass and floral bouquet to your nose and palate. Quite a kick at the end. Rhum Agricole lovers can easily add 2 points to my score. Prima rhum voor in de Ti'Punch. Wel wat bloemig en wat minder grassig dan een Clement, JM of Trois Rivières. Lekker. C est un grand classique un des meilleurs blancs.je préfère chez eux l esprit 2 ou l esprit 2 bio.mais celui ci est plus doux que la version 55deg.tres bon rapport qualité prix.un must pour débuter les blancs agricoles. Comme la plus part des rhums de l'habitation Neisson, le blanc 50 est de très bonne qualité. Un petit morceau de citron, une cuillère de sucre en poudre du Galion et du rhum Neisson; nous voilà parti pour un excellent ti punch! Le Neisson 50° à la réputation d'être le meilleur rhum blanc de Martinique. Si le nez est agréable, très fruité, ce rhum a une attaque très sèche, avec une forte note d'alcool. Suivent des arômes de fruits et de canne. Un nez surprenant, floral, fruits exotiques. En bouche, cela reste un rhum blanc. Mais excellent pour un punch! Good punch for the Ti punch. 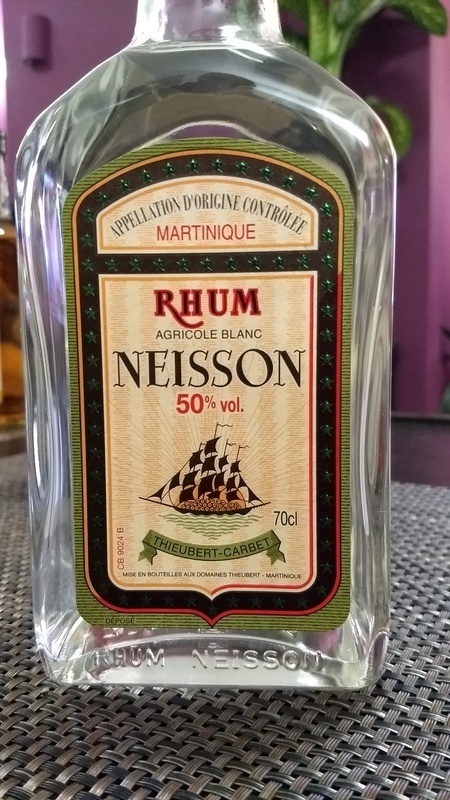 The NEISSON white rum is one of the best agricole white rums I know! Perfect for Ti-Punch or flavored rums, it's a little expensive but very very good! One of the better white agricoles that I have had. Not a huge fan, but good to mix with fruit.